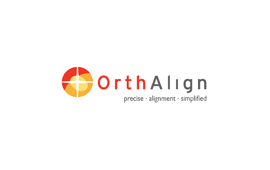 CTV > News > Services > Life Science > OrthAlign, Inc.
OrthAlign, Inc. is a privately held medical device company that was established in Laguna Beach, CA, in the summer of 2008. The company is developing a line of computer assisted surgical devices that distill the critical features and benefits of large surgical navigation systems in a non-invasive, disposable, palm-sized solution. OrthAlign’s goal is to create a new standard of care in total joint replacement, making consistent and measurable results accessible to surgeons and patients.